Hare's-foot Inkcap - Coprinopsis lagopus. Observation - Hare's-foot Inkcap - Coprinopsis lagopus. - UK and Ireland. 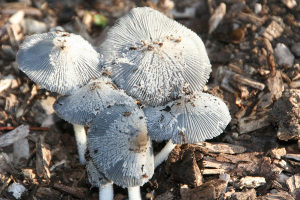 Description: Small fungi growing on woodchips in a Surrey wood. Very short lived - present early morning but gone but mid-afternoon usually. Small fungi growing on woodchips in a Surrey wood. Very short lived - present early morning but gone but mid-afternoon usually.